Parent and Family Programs partners with students’ families to help them thrive at OU, on campus and in life. We strive to welcome, connect, and refer families to the resources they need to ensure their students succeed. Greetings parents and families of new Sooners! We invite you to join us at one of our Parent and Family Orientations this summer. Save the Date for Mom's Day this spring - April 3-5, 2019! While honoring moms, this weekend has activities for the entire family. Moms, dads, siblings, grandparents, and the whole family is welcome! The weekend is hosted and planned by Campus Activities Council (CAC). Sooner Parents keeps you connected to campus and enhances your student's OU experience. Enjoy a stronger connection to The University of Oklahoma by becoming a member today! Purchase your official Oklahoma Parent swag today! Pick-up and delivery options available. Sooner Sense is the debit account on your student's Sooner Card. Utilize Sooner Sense by swiping or tapping the Sooner Card for financial transactions across campus. Welcome to the OU Family! As part of your student’s support system, you play a critical role in helping your student succeed from orientation through graduation. We are eager to partner with you in that effort- providing resources, education programs, and opportunities to connect your family to the diverse range of experiences available at OU. Parent and Family Orientations this summer! SAVE THE DATES for Family Weekends! Moms, dads, siblings, grandparents, and the whole family is welcome! Both weekends are hosted and planned by Campus Activities Council (CAC). Sooner Parents keeps you connected and enhances your student's OU experience! We hope that you’ll join Sooner Parents and benefit from the e-newsletters, access to purchase football tickets, scholarships and local discounts for students of members-only! Buy your official Oklahoma Parent swag today! Our goal is to share helpful, timely information about your student’s college experience and to connect you to relevant campus and community resources. 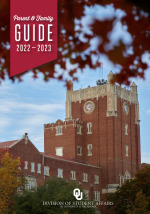 Calendars are complimentary for freshman parents, and lifetime and four year members of Sooner Parents. We hope you enjoy this calendar with beautiful photos of campus and student life! There is also important dates and information included.